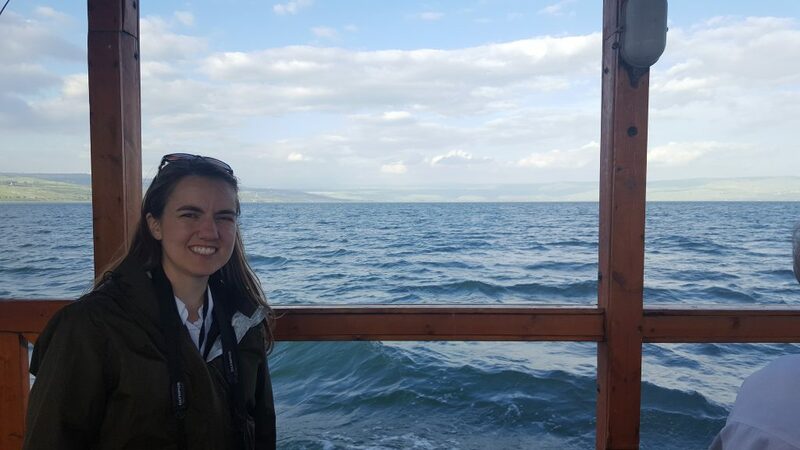 In this edition of “Liz goes to Israel and Jordan” you will learn about doing yoga on the shores of the Sea of Galilee. 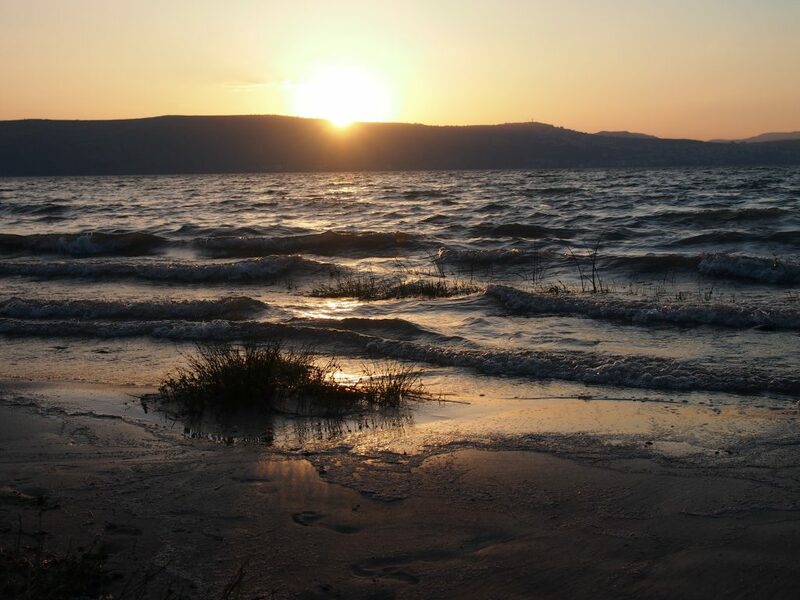 So, we did yoga on the shores of the Sea of Galilee. One of the gals on our trip, Susi, is a yoga instructor, which we discovered on our run together along the Mediterranean Sea the first day. Since suddenly we were all about fitness (or just doing something with the hours we clearly weren’t sleeping in the morning–jet lag, plus daylight savings time changes 3 times on our trip), we convinced her to do some sessions in the mornings before we got ready for the day. I’m not a yogi (is that what they’re called?) but it was kind of fun to try something new and to spend more time in that beautiful place. After yoga one of the mornings, several of the people went out for a swim. It wasn’t exactly warm, so I decided to just wade in the water till I got my legs all wet. 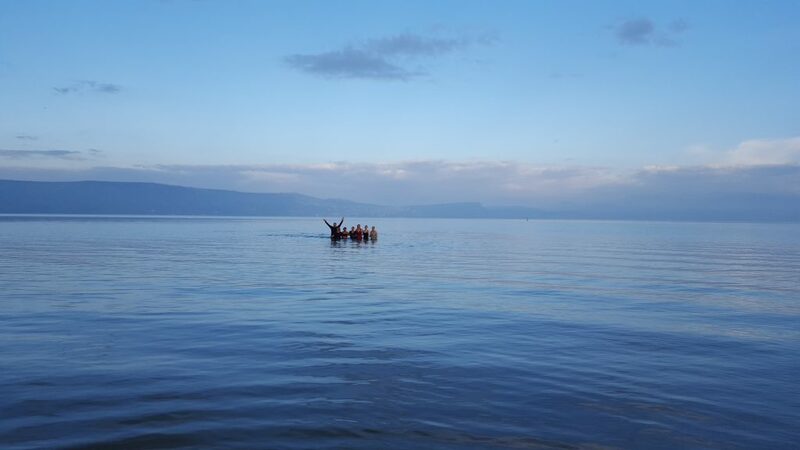 Swimmers in the Sea of Galilee. The day we were leaving, the staff put up signs about where people should and should not swim, to prepare for the tourist season. I guess they didn’t expect such an ambitious group to go out in the water so early in the season! For the rest of the morning, we hopped from one rocky ruin or hilly beauty to another. Our first stop was Capernaum. 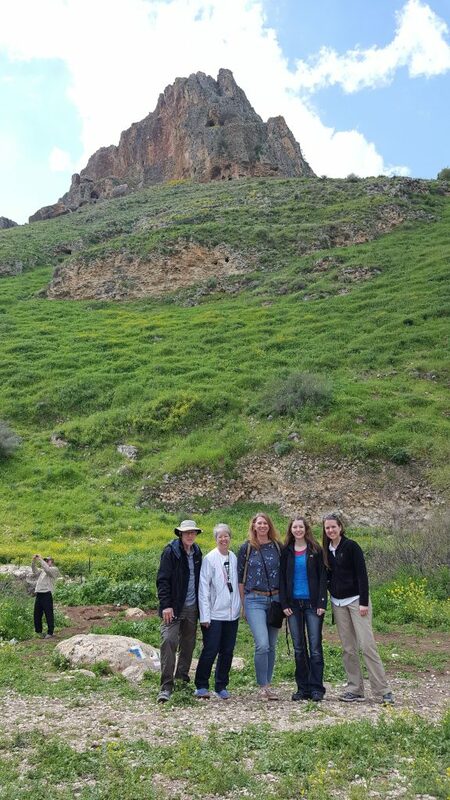 Along the way, we learned the approximate location of Bethsaida (named as a home for Peter, Andrew, and Philip in the Bible). Capernaum was also the home of Peter and Andrew, as well as Matthew (Bible scholars have many theories why two locations are named as the cities of Peter and Andrew, but I’ll let you look that up and decide). 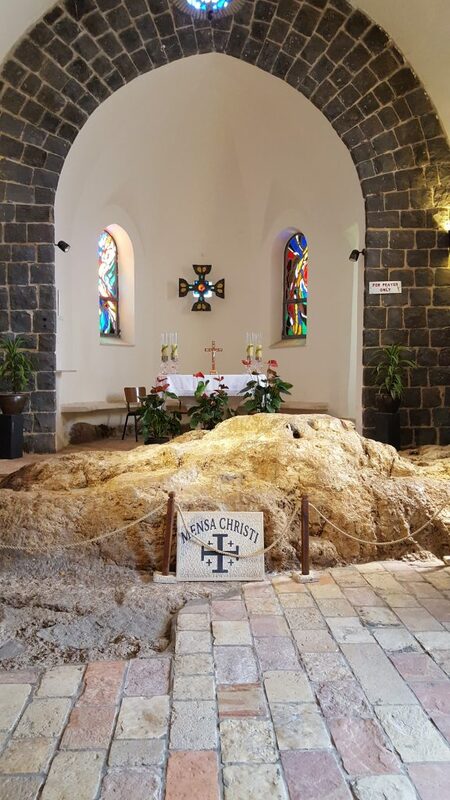 Most importantly, though, this is the place where Christ lived after he began His ministry. 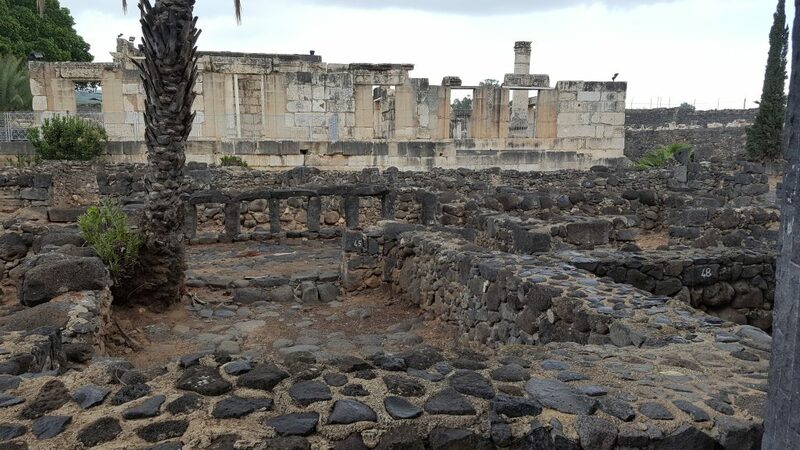 When we read of “his own city” in the Bible, it is referring to Capernaum. Many, many miracles were performed here. One of my personal favorites is when Christ heals Peter’s mother-in-law. This has always impressed me that this woman would immediately minister to Christ and all who came with him after she was healed. I imagine she had likely followed Christ when she learned of Peter’s call to the ministry. I imagine she loved the change that Christ was bringing into Peter’s life (what mother-in-law wouldn’t, right?) And I imagine her desire to show her discipleship. We don’t know much about this woman, but I love that this small story was included in the New Testament. Capernaum would have been a city of about 1500 at the time of Christ, but it was a very crowded city, if the ruins give any idea. The cities were made of basalt stone in this region so it’s much darker than the limestone of the areas in Jerusalem, as I previously imagined the cities to be. Some of the original ruins of Capernaum in the basalt stone. This is a synagogue built in the 5th century AD. 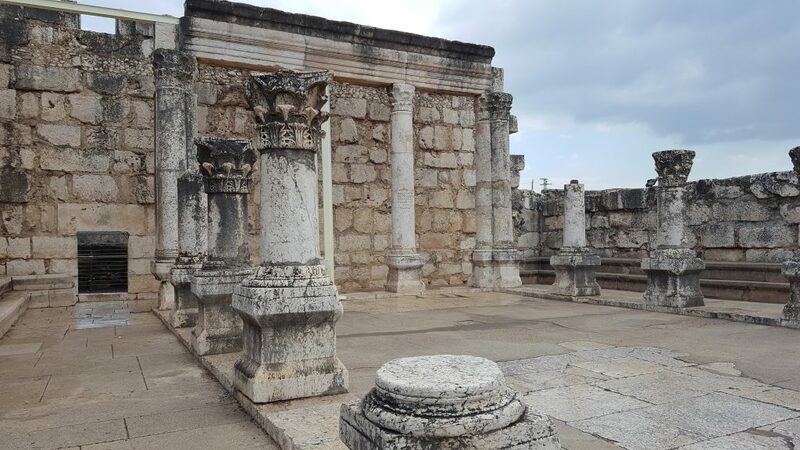 It was built on the ruins of the “Synagogue of Jesus” where Jesus taught on the Sabbath and also where he cast a devil out of a man (Luke 4:33-36). The synagogue pointed south toward Jerusalem. The ruins of the House of Peter (in the center). This place is referred to as the House of Peter as there are signs and symbols referring to Christianity and some graffiti etched in the stones naming it as such. While it may not be the House of Peter, much of Biblical history is built on tradition. When places were sacred, they were often protected and maintained as holy sites throughout the centuries, even when wars and kingdoms didn’t see them as holy. Tradition can be one of the strongest indicators to look for evidence of historical fact. At any rate, this was clearly a holy place of Christian worship as the Byzantines built the octagonal Church around this quite ordinary house. The Franciscan monks now own this site and have built a church over the top of the ruins to preserve them, with a glass floor to look down on them. 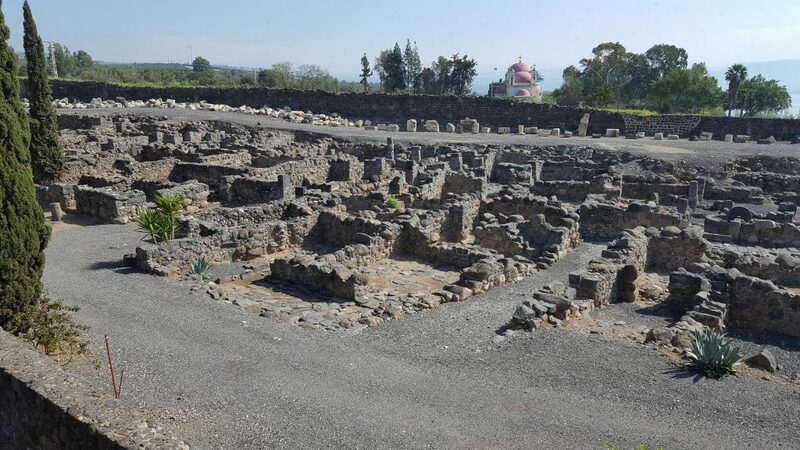 Ruins of the ancient city of Capernaum. It was surprising to see how close together the homes were and how small the streets are. The communities were very compressed and compact. It would have been quite difficult to find a place to be alone here. I imagine the crowds thronged Christ much of the time. 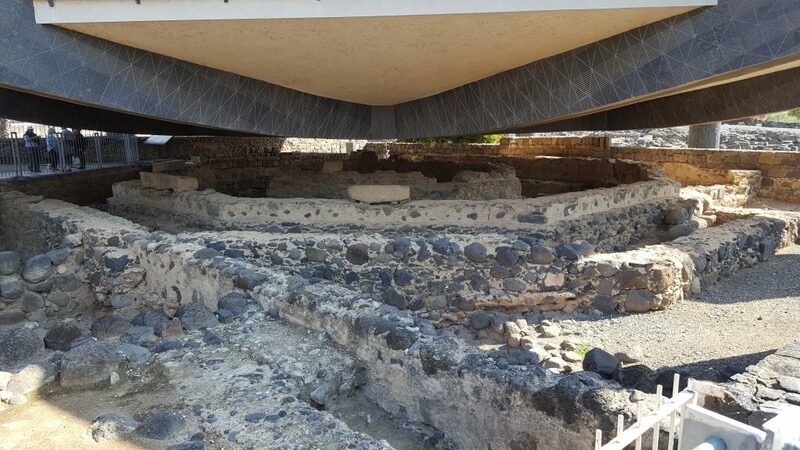 As you can see it would have been hard to get into the homes if they were full and crowded, hence the reason why the paralytic man was eventually lowered through the roof to be healed, a miracle that took place here in Capernaum. The actual location of the Sermon on the Mount is, as you guessed, unknown. But this is the traditional mount, close to Capernaum, where this amazing sermon was given. The Franciscan church in the picture below was built to mark this as a sacred place and is octagonal for the 8 beatitudes. Matthew, who recorded the sermon, was a tax collector and so he had materials to write and record things which many others may not have had. So he likely was able to record events and sermons as they happened, which may be why we have so much of the sermon preserved. The church has beautiful gardens surrounding it on the hillside. The monks let you sort of “rent” a space where you can sit and enjoy or discuss things with your group. So we got to read the Sermon on the Mount on the mount. And we heard others singing songs and I particularly loved a group that was singing “How Great Thou Art” in another language that I couldn’t recognize exactly but was likely Italian. Faith is a beautiful thing. The following section of the Sermon on the Mount has always been my favorite because it is mentioned in my Patriarchal Blessing and has guided my life in so many ways. “Ye are the light of the world. A city that is set on a hill cannot be hid. Neither do men light a candle, and put it under a bushel, but on a candlestick; and it giveth light unto all that are in the house. Let your light so shine before men, that they may see your good works, and glorify your Father which is in heaven” (Matthew 5: 14-16). 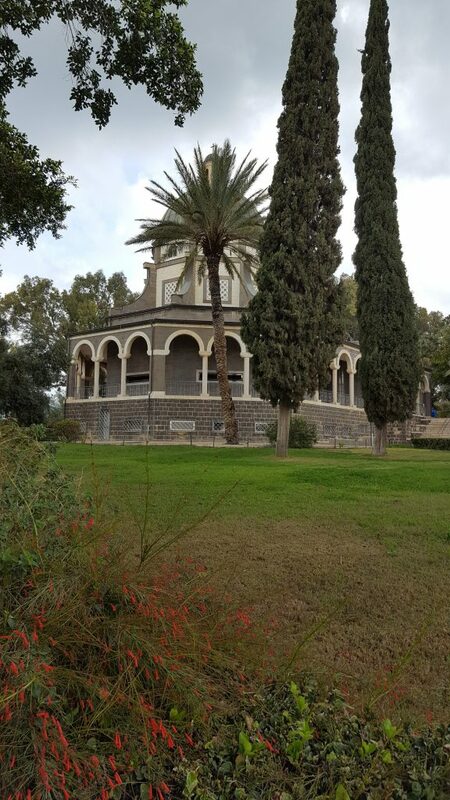 Nearly at the bottom of the Mount of Beatitudes is this Franciscan Church of the Primacy of Saint Peter. This commemorates the traditional location where Christ appeared to his apostles after his resurrection. It is close to the shores, where Christ would have seen his apostles who had returned to their fishing career and were having no success. He calls out they should cast their nets on the right side, and then they could not draw up the nets for the multitude of fishes. And I love what impetuous Peter does. “Now when Simon Peter heard that it was the Lord, he…did cast himself into the sea” (John 21:7). I hope that I would be that anxious to meet the Savior. More than all of this? This career? These fish? 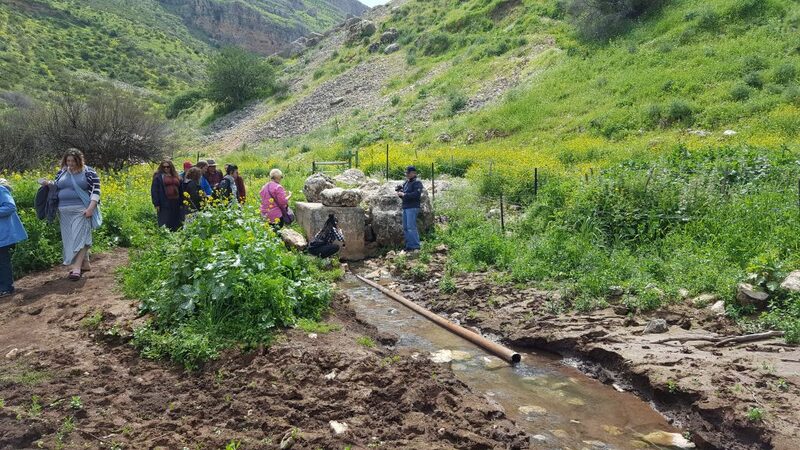 This land of the Galilee? Even these friends. Then follow me. “Feed my lambs.” “Feed my sheep.” “Feed my sheep.” The Savior knew all that would happen in Peter’s life and his ministry. He knew all his faults but he also knew who he could become. Perhaps he wanted to ensure that Peter was following willingly. That it was his heart, his choice, his will. I ask myself the same question, if I love Christ more than “all of these” other things in my life. Mensa Christi. The traditional place where Christ ate with the apostles after his resurrection. This is a beautiful canyon that was used as a traveling route from the upper Galilee (Nazareth area) to the Sea of Galilee. It is the most direct path from Nazareth to Capernaum so it’s pretty much certain Christ would have walked the path through this canyon. There’s an artesian spring here that was frequented by travelers. 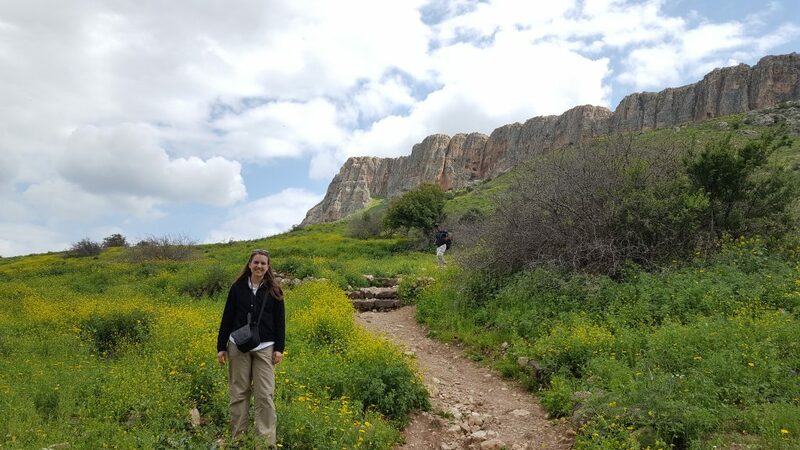 Maybe this is why I like the natural areas of the Galilee so much–because it’s more similar to what things would have been like at the time of Christ. It is near here where Christ’s second miracle was performed. A nobleman came to Christ and asked him to “come down” (from Cana to Capernaum–he would have traveled along this path) and “heal his son”. Christ tells him, “Go thy way; thy son liveth.” “And the man believed the word that Jesus has spoken unto him.” It was clearly a journey for this man (again indicating the likely usage of this path) because we hear “as he was no going down, his servants met him, and told him, saying, Thy son liveth.” He inquires when his son was healed, and it was at the time he met the Savior the previous day on his journey. 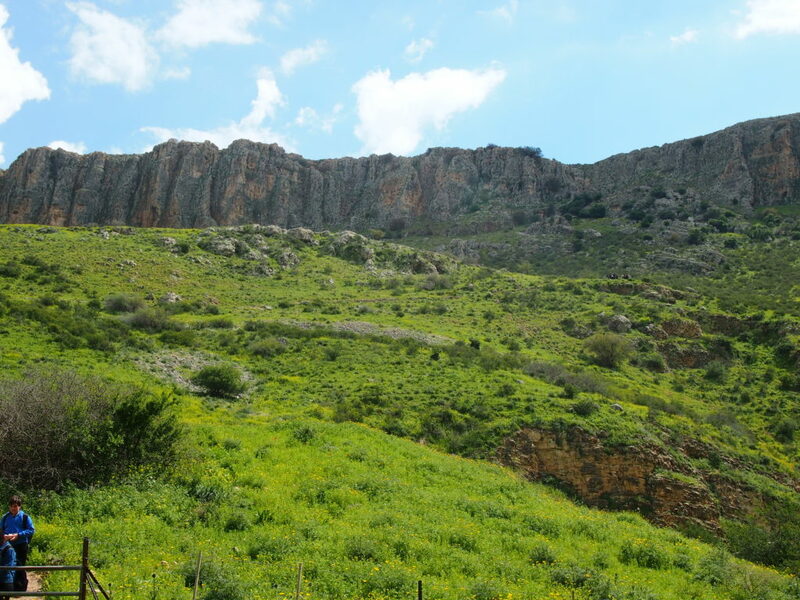 Mount Arbel is also host to many caves which were where Jewish fighters were trapped by Herod’s armies as recorded by Josephus (an amazing first century scholar who provides incredible insights into the history of the Holy Land). The mountains in the back are host to the limestone caves used by armies to hide during wars. More views of Wadi Hammam. It’s seriously so beautiful. Magdala is incredible. It is supposed by some scholars that this is where Mary Magdalene would have been from but (do I have to say this every time? haha) without solid information, there could have been another city of this name. This was a short-lived city that was destroyed by the Romans in 67 AD (First Jewish Revolt). Nothing has ever been built on top of it in all these years. 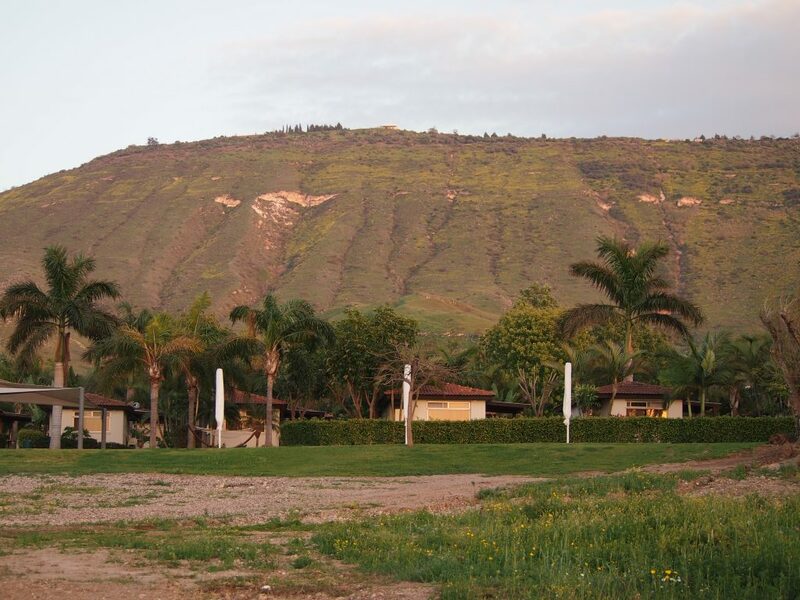 In 2009, Father Juan Solana had envisioned a place of spiritual retreat on the Galilee. As he began construction of his guest house, they uncovered a First Century Synagogue. 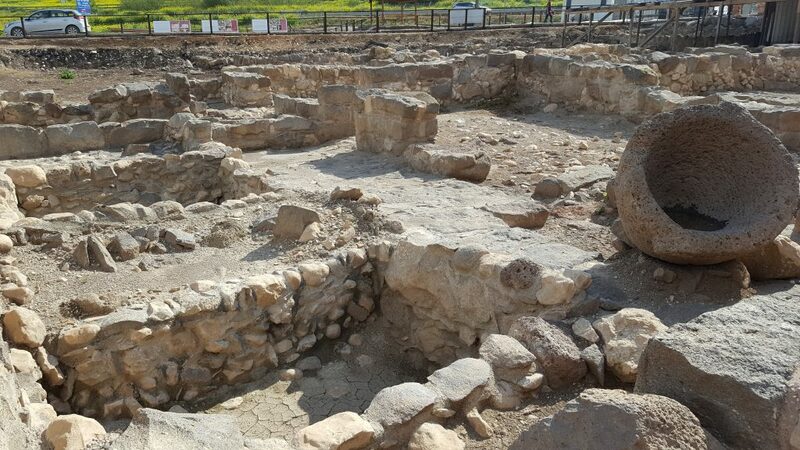 Construction immediately stopped and excavations began and an entire first century Jewish town was discovered. Excavations are ongoing here and our tour guide told us they’d found Roman coins in the ruins just that week. If I were to go back in a few more years, there would probably be even more to see in these ruins. This place gave an excellent view of what life would have been like and the types of buildings in the cities. Our tour guide was a Christian missionary. His wife had passed away and he felt a need to serve so he came to help at Magdala. He often spends time with the excavations, dusting off stones and the like. And he gives tours. I thought his devotion was so touching. He shared stories and he shared his feelings about Christ. I loved him for it because it reminded me of how hard it was to be a missionary but how wonderful it was to have so many opportunities to speak of Christ. I also loved this place because I love Mary Magdalene for several reasons. She was a follower of Christ. She believed. She was the first to see the resurrected Christ. And also because my great grandma’s name was Mary Magdalene (very Catholic family). Her mother (Mary Margaret) must have loved the story of Mary Magdalene. And Grandma Mary Magdalene must have learned to love this woman she was named after. I like to think things like that do get passed down in the DNA. At Magdala is a monument/building built to women. In the basement of the building is a beautiful painting of the woman with an issue of blood who touches Christ’s hem. Just imagine the pain she must have had for years. And the isolation, as she would have been unclean, and unable to touch others. Not a hug or a kind gesture. She believed what she had heard from others–that even touching Christ’s garment could heal. 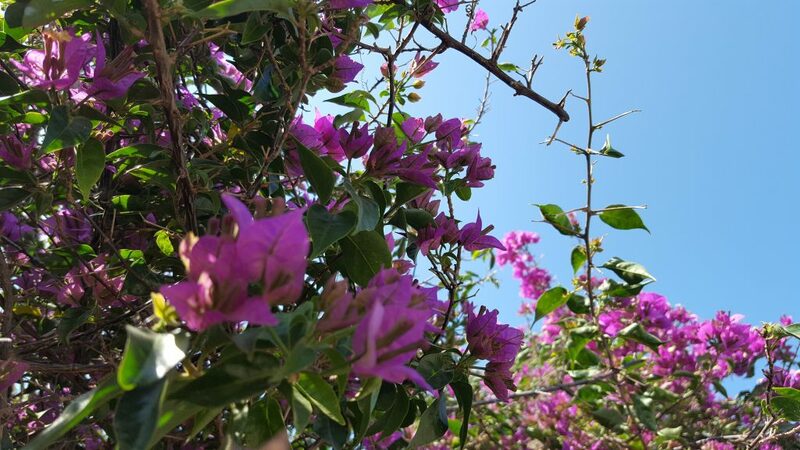 And she, being unclean, and knowing what that would mean for an unclean woman to touch a clean person, still trusted more in her ability to be healed than in the shame she could experience if she were not. And she reached out with faith, touched the hem of his garment (likely the fringes in the border of the garment–a symbol of keeping the commandments–which just speaks to the power of covenants and obedience and faith) [Numbers 15:37-40] and was healed. And was clean. What an incredible relief and complete life changer for her to then lead a normal life. Upstairs in the monument to women building are pillars with names of the women who followed Christ. One pillar is left empty for women to “write” their names with their fingers as followers of Christ. At first I thought it was kind of weird, because I’m like that. But why should it be weird? I added “Liz” to that pillar of women who believe in Christ because I believe in Christ. 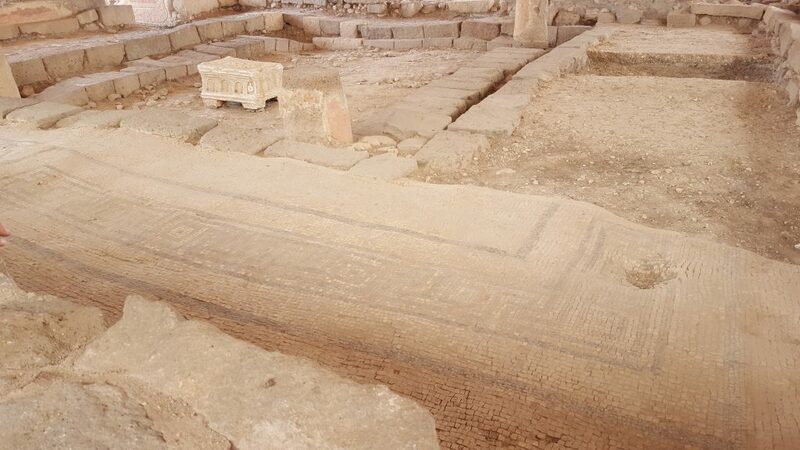 Mosaic floors in Magdala. Also a replica of the Magdala stone (the bench/table thing in the middle), said to be one of the greatest archaeological finds in the past 50 years. Ruins of the Jewish city Magdala. 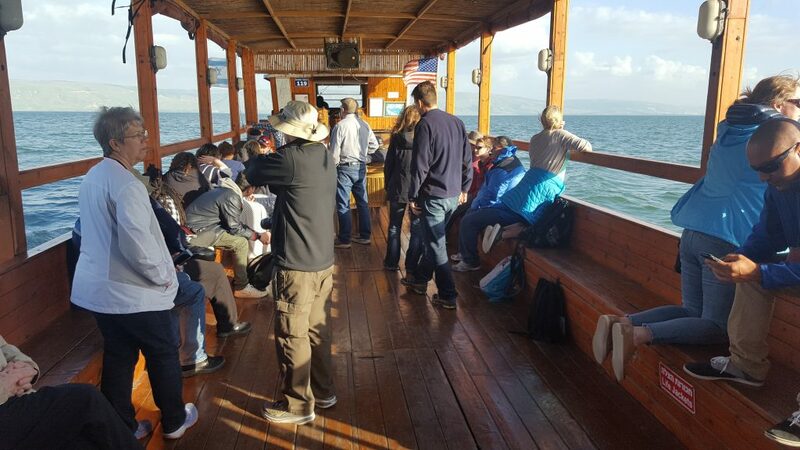 I’m pretty sure you can’t go to the Galilee and not go on a boat ride. I think it’s a requirement. And I’m so glad. It gives you a sense of the expanse of the sea. It gives a sense of the winds and the waves that obeyed the Savior’s will. 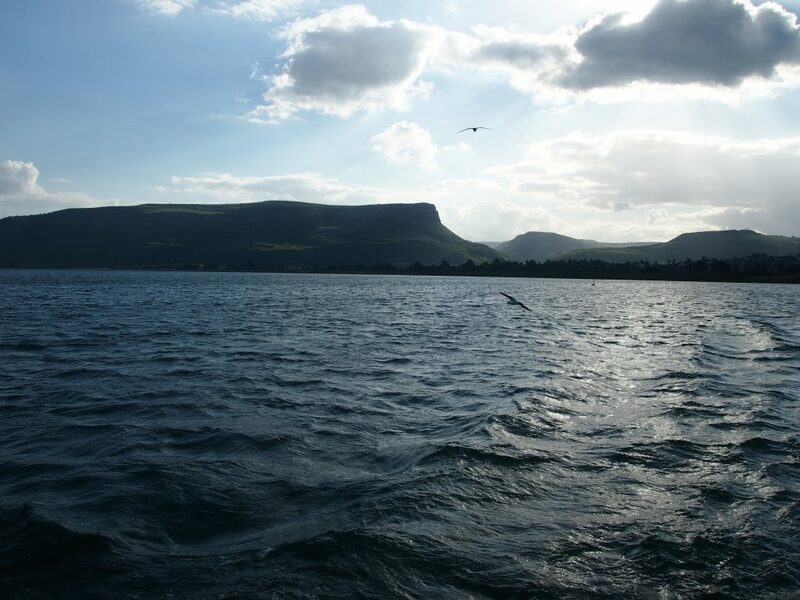 It gives a sense of the water Peter stepped out on and the fear he must have felt when he began to sink. This is the “Sea of Galilee boat” or “Jesus boat” in the Ginosar Museum. 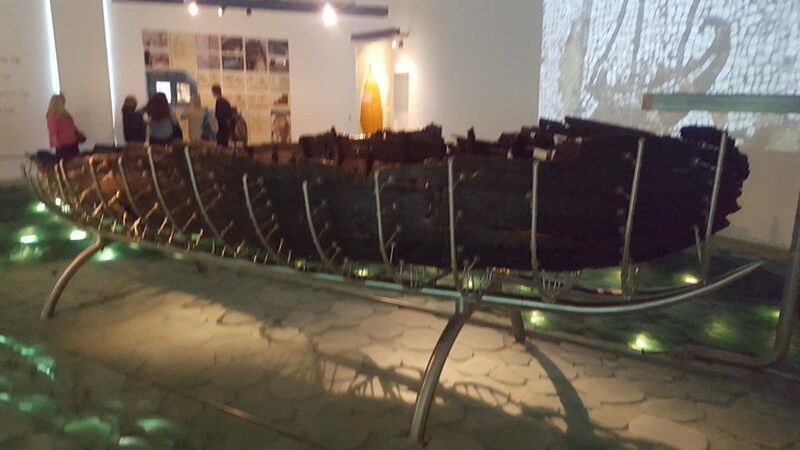 This is a boat from the 1st or 2nd century that was uncovered when the sea receded in 1986. It was preserved and moved to this museum to show what a fishing boat may have looked like at the time of Christ. 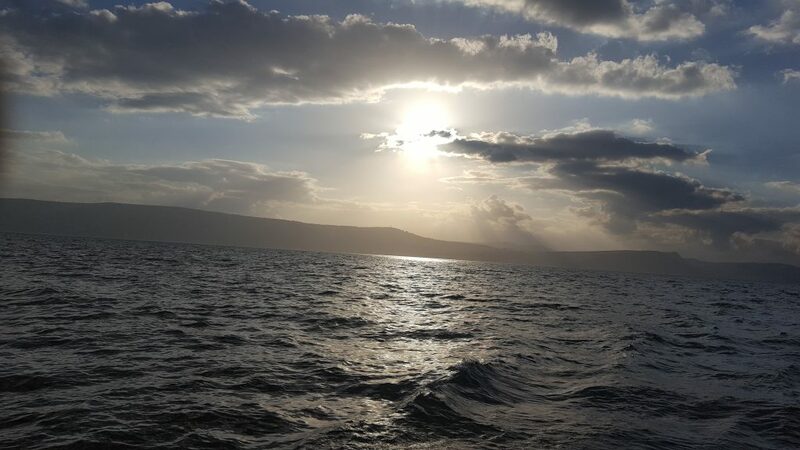 Looking toward Tiberias on our boat ride. 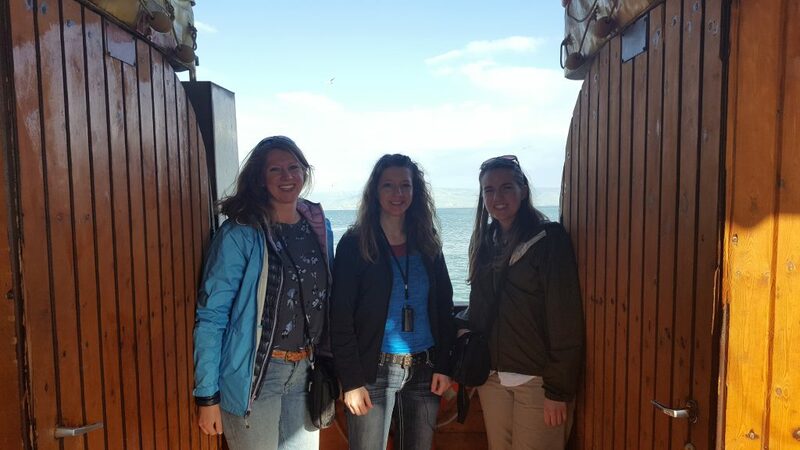 Julie, Jennae, and me on the boat on the Sea of Galilee. 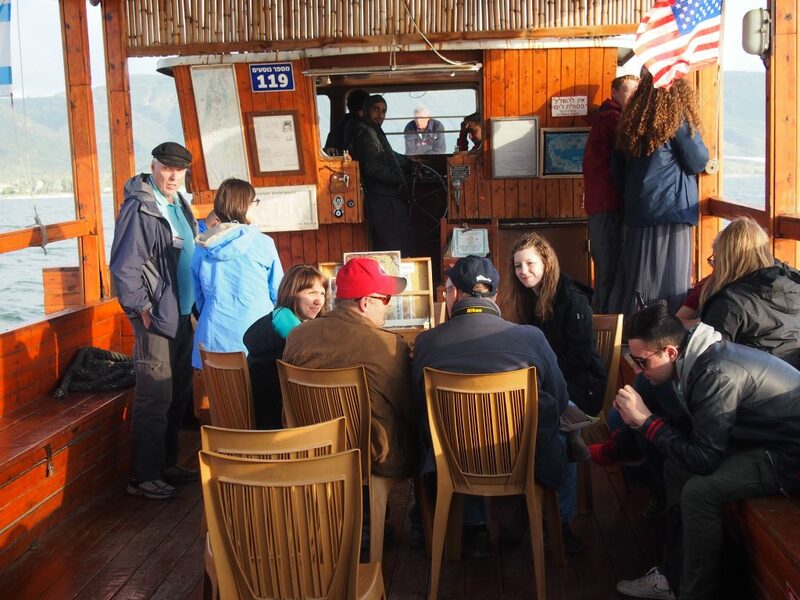 Our groupies on the Sea of Galilee. I took this so you could 1) see what our boat looked like and 2) see that I actually did travel with other people. The sun kept setting, so I kept taking pictures. Listen, this blog is kind of like my journal for Israel. 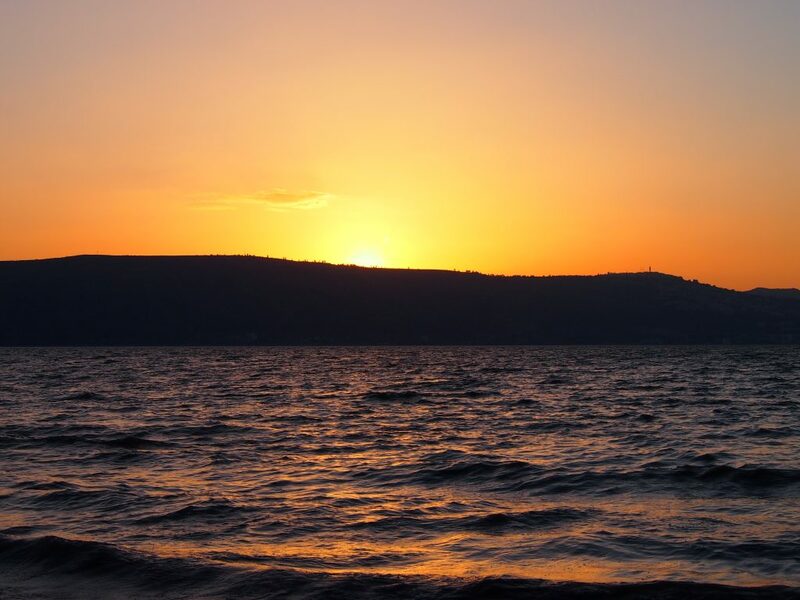 So I’ll put as many sunset on the Sea of Galilee pictures as I want! Haha! 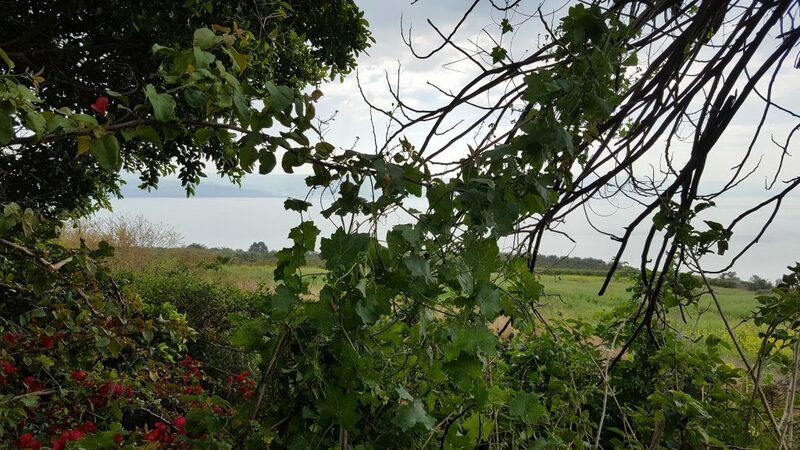 View of the kibbutz (little cabins) where we stayed on the Sea of Galilee. Taken from the shore and looking at the Golan Heights in the background. 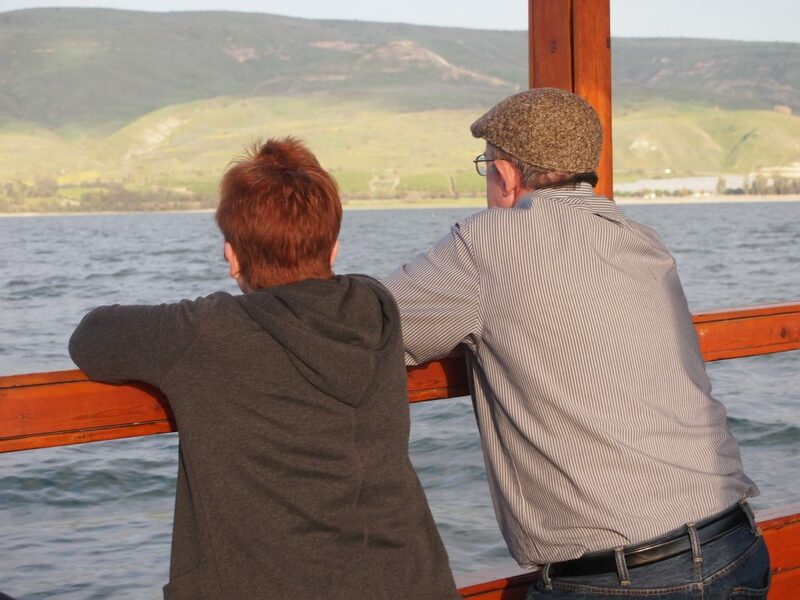 Brian and Becky looking out over the Sea of Galilee.